Udonmap was originally set up with the launch of the website in November 2003. 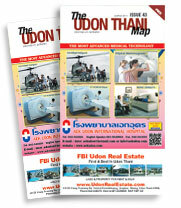 The first map came out in January 2004 and as such was the original English map of Udon Thani. 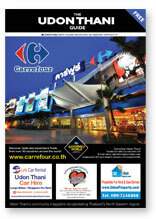 The magazine, entitled “Udon Thani Guide” was added in April 2007 to supplement and expand on the information contained in the map. Since then the Guide has been further enhanced to embrace Nong Khai and Khon Kaen, and Udonmap now incorporates: nongkhaimap.com, khonkaenmap.com, loeimap.com, and khoratmap.com. Some 24000 full colour glossy magazines and 30000 maps are printed annually. Copies are available through the courtesy of hotels, guest houses, restaurants, sponsors, airport arrival hall, TAT, tourist police and shopping center information counters. If you miss an issue, don't forget our online versions. Now entering our eighth year, the Udonmap and Udon Thani Guide are considered to be the most comprehensive, best informed and most respected publications of their kind in the area. Udonmap’s informative, online city portal and busy community forum with over 16,000 members, and averaging 5,000 visitors (hits) daily, provides no-nonsense information on almost every Udon Thani related subject. Udonmap is No 1 in Google, Yahoo, Bing and other popular search engines based on the keyword Udon Thani. Google page rank number 4. Besides being one of the most effective advertising formats in the area, advertising rates are still the cheapest in town, starting from as little as 333 baht per month. Why not give us a try! All advertising packages come with a free basic webpage, links, business directory listing, forum thread, marking on both paper map and interactive Google map. Also on-going promotion throughout the year. In addition to the above udonmap also offers free classified Ads available on our website. Website design, graphic design, video production, photography and SEO (search engine optimisation). Udonmap.com - Udon Thani Mapped Out!